Daily devotional readings in Scripture, the Westminster Standards, & Presbyterian history. First, a portion of biographical background on Dr. Benjamin B. Warfield and his wife Anne. Following that introduction, a letter that we came across, published in an old PCUSA magazine, which provides some additional insight on the marriage of Benjamin and Anne Warfield. 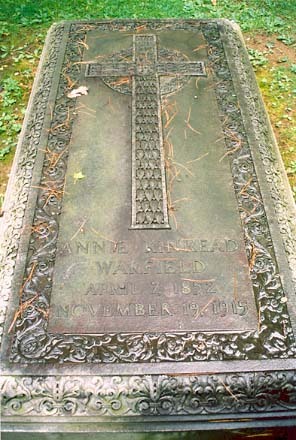 Pictured at right : the grave site of Anne Pearce Kinkead Warfield, [7 April 1852 – 19 November 1915]. Benjamin pursued his theological education in preparation for the ministry by entering Princeton Theological Seminary in September of 1873. He was licensed to preach the gospel by Ebenezer Presbytery on May 8, 1875. Following licensure, he tested his ministerial abilities by supplying the Concord Presbyterian Church in Kentucky from June through August of 1875. After he received his divinity degree in 1876, he supplied the First Presbyterian Church of Dayton, Ohio, and while he was in Dayton, he married Annie Pearce Kinkead, the daughter of a prominent attorney, on August 3, 1876. Soon after he married Annie, the couple set sail on an extended study trip in Europe for the winter of 1876-1877. It was sometime during this voyage that the newly weds went through a great storm and Annie suffered an injury that debilitated her for the rest of her life; the biographers differ as to whether the injury was emotional, physical, or a combination of the two. Sometime during 1877, according to Ethelbert Warfield, Benjamin was offered the opportunity to teach Old Testament at Western Seminary, but he turned the position down because he had turned his study emphasis to the New Testament despite his early aversion to Greek. In November 1877, he began his supply ministry at the First Presbyterian Church of Baltimore, where he continued until the following March. He returned to Kentucky and was ordained as an evangelist by Ebenezer Presbytery on April 26, 1879. How do you define love? We should first think of love not as emotion, but rather understand true love as a committed covenant faithfulness. Emotions will result from such a commitment, but the undying commitment must first form the foundation. Dr. Warfield in his care for his wife exemplified such a love for us. The college has taken Dr. Francis L. Patton from us to succeed Dr. McCosh. The seminary has lost a David in Dr. Patton, but gained a Solomon in Dr. Warfield, a man of war exchanged for a man of wisdom. Dr. Warfield is a thorough scholar, but he is more than a scholar, he is a gentleman. This year the seminary faculty has taken great pains to impress upon the students that a Presbyterian minister should be a gentleman. Our new professor is an ever present example. However great may be the provocation, he ever exhibits the utmost gentleness. “His heart is as soft as a woman’s. To a worm he would give the path.” Yet with all his delicacy of feeling are coupled the sterling qualities of a true manhood, which command the highest respect and reverence. When the balmy days of Spring came, Dr. Warfield could often be seen walking with his wife about their little garden. Now this is a small matter; we often see people walking in their garden and think nothing of it. But such a display of domestic feeling is so unusual in Princeton that the eye of the seminary student cannot but see, and his heart cannot but be affected at the sight. It was my intention to say something about the undercurrents of thought and of feeling among the students themselves, but my space being limited I shall reserve that for a future letter. The Church at Work, 2.33 (24 May 1888): 4. The family reading for 19 April 2019. The secret reading for 19 April 2019.